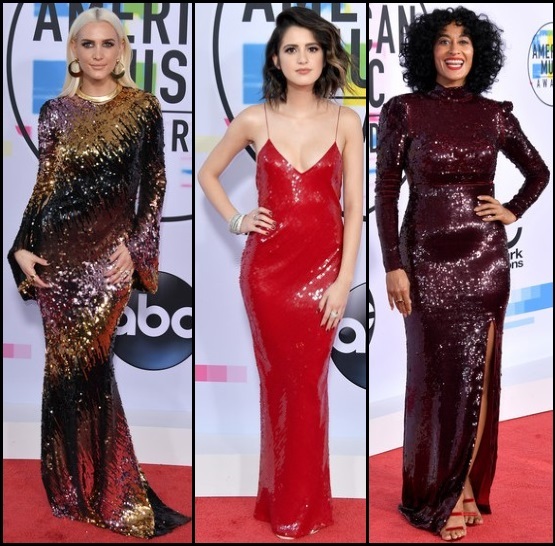 From leather dresses to jumpsuits, black was the most popular color seen on the red carpet at the 2017 American Music Awards. Here are some other trends and looks from the awards show. Selena Gomez showed off her new blonde hair in a Coach leather biker jacket dress. Hailee Steinfeld wore a black leather bra and Mugler suit. Ciara showed off her legs in a long-sleeved Alexandre Vauthier dress. Corinne Foxx wore an eggplant-colored keyhole jumpsuit. Rachel Platten sparkled in a Thai Nguyen Atelier jumpsuit. Maia Mitchell wore a one-shoulder Alberto Audenino jumpsuit. Heidi Klum wore a vintage Versace gown. “Riverdale” star Madeline Petsch wore a plunging black Fabiana Milazzo dress. Jenna Dewan-Tatum went glam in a plunging Julien Macdonald gold gown. Lili Reinhart wore a side-slit Cushnie et Ochs dress. 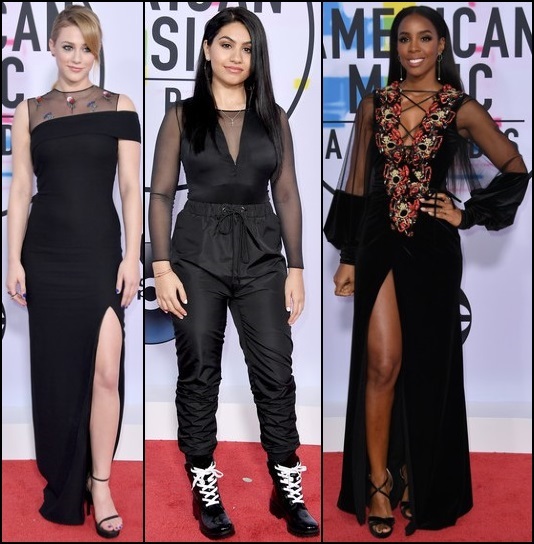 Alessia Cara went with a black sheer-sleeved jumpsuit. Kelly Rowland wore a black sheer-sleeved side-slit Galia Lahav gown. Ashlee Simpson wore a multi-colored long-sleeved Christian Siriano dress. Laura Marano kept it simply sparkly in a red Stella McCartney slip dress. Tracee Ellis Ross sparkled in a long-sleeved Stella McCartney dress.